After a long and exhausting day on the range, I was looking for a beer with which to relax, and sooth a few aching muscles. I was in the mood for malty, and robust, so I opened the door to the beer fridge and started looking. I spied a bottle of Real Ale Phoenix Double ESB. This was one of the beers I received from blogger 45er last Spring. Frankly, it had gotten lost amongst the other bottles and forgotten. Hmm, that sounds like just the ticket. What could be better to celebrate a great day at the range than a beer from a fellow shooting and beer enthusiast? 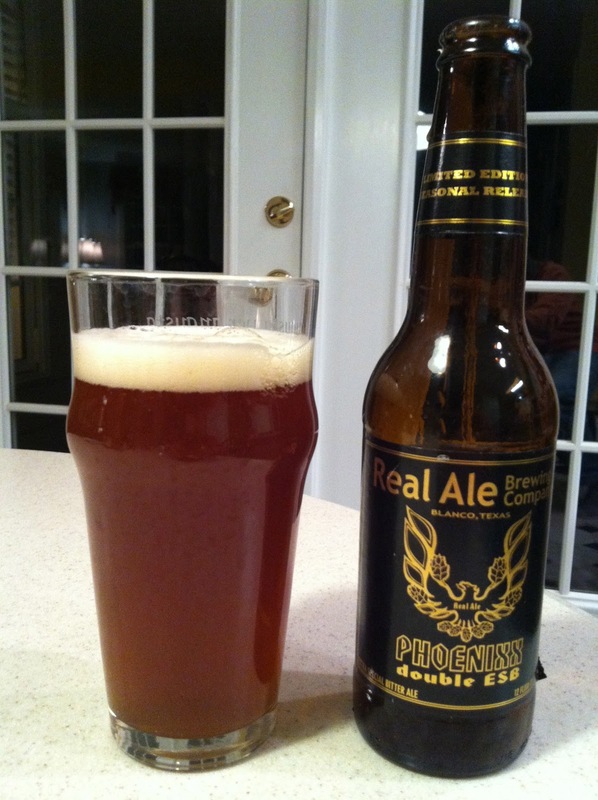 This ale from Real Ale Brewing Company pours a brownish copper color, with a thin but persistent beige head. The aroma is strong. I picked up the sweet malt and toffee notes immediately as I was "staging" the beer for a photo. I was really looking forward to tasting it at that point.The flavor is a sweet blend of toffee and caramel. There's a roasted, almost burnt, aspect that is especially appealing. The brewer also made sure the hops were rich as well. There is also a respectable level of bitter grapefruit rind citrus present. The finish is bitter and dry. I really liked this beer. It reminds me of one of my perennial favorites, Winter Storm "Category 5" Ale from Heavy Seas Brewing, but with more citrus notes. I checked the Real Ale web site for more information and learned that Phoenixx is a Winter seasonal. I am going to have to remember to beg more of this from 45er next Winter. Maybe we can even make a trade of our local Double ESBs. Thanks for the tip! Never heard of Real Ale but a trip to tbeir website yielded a beery quote from Frank Zappa...they gotta be good! I'm looking forward to more from them myself! Oh, that's a really good one. One of my occasional favorites. I first had it on tap at a local bar that specializes in great beers. It's even better on tap. I still have some rolling around in the beer fridge. It's not one you hit on regularly, but it sure hits the spot when you crack one. Glad you enjoyed. Thanks again for the great selection of Texas beers! You're welcome. We'll have to organize a different season next time. Real Ale's Lost Gold IPA is another one you'll like. That's the one that ended up pulling a seppuku on you.